""The Nissan GT-R has received a ton of love from the media. WebRidesTV.com test drove the car too and were split 50/50. Half of the reviewers wanted to sell the farm and buy the GT-R and the other half thought it lacked the appropriate refinement, especially the transmission. We put the GT-R up against the Ford GT to see if a completely different gene pool, in each case producing similar performance but totally different approaches to the automotive experience, could generate some surprises in the results," says Technical Editor at WebRidesTV.com Larry Harvey. Harvey continues, "Can an American mid engine rear drive shade tree car with the raw spirit of sixties racing in mind, beat the futuristic mid-front engine all wheel drive Japanese dragon?" "
"WebRidesTV.com and professional race car driver Craig Stanton tested the 2009 Nissan GT-R against the 2006 Ford GT on a WebRidesTV.com Super Lap which includes, high speed transitions (slaloms), a decreasing radius turn, a constant radius turn and a straight away. 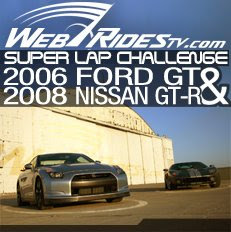 The Nissan GT-R vs. the Ford GT video will be released in June 2008 on WebRidesTV.com. For car videos about the Nissan GT-R including coverage from the recent LA Auto Show visit WebRidesTV.com. WebRidesTV.com is a popular Web destination for original and user-generated auto media, auto reviews, contests, profiles and aftermarket performance techniques. Headquartered in Culver City, California WebRidesTV.com cultivates auto media amidst the thriving backdrop of the Southern California auto scene. While the coverage and reach of WebRidesTV.com is worldwide, it is the Southern California vibe that drives the website's growing popularity. For more information, please view the About Us Video at WebRidesTV.com. "